Preheat oven to 375°F. Place a chicken breast half between two sheets of wax paper. Using a meat pounder, rolling pin or bottom of a small skillet, gently pound chicken until evenly flattened. Repeat with remaining chicken. Melt butter with honey in a small saucepan over medium-low heat. Stir until smooth and blended. 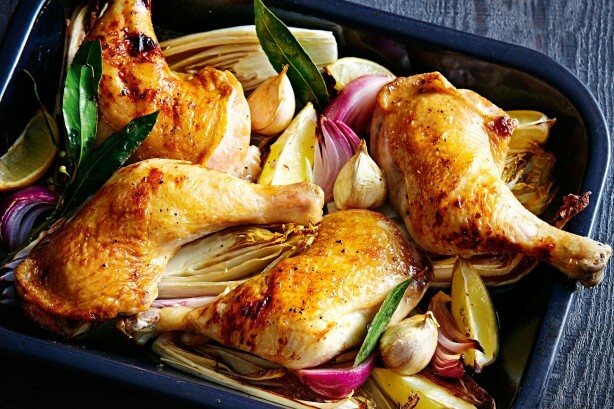 Arrange chicken in a baking dish large enough to hold it in a single layer. Season with salt and pepper. Pour warmed honey mixture over chicken and place lemon slices on top. Cover baking dish loosely with foil and bake until chicken is opaque and firm to touch, about 20 minutes. Spoon juices from bottom of baking dish over chicken and lemon several times. Sprinkle chicken with rosemary.